Someone is walking again! These are small steps for me, but giant leaps to gaining my life back. My cousin, Natalie, was able to capture my first steps… with Jeff by my side. My mother-in-law and sister-in-law came to visit the last few days, and they were able to take me to my first physical therapy session on Tuesday. One of our photographers was there, and he’s working on putting together a “welcome back” piece for the news. I was so nervous, to stand up and walk… but my physical therapist said I did great! I was able to walk around the entire facility… without a cane or walker. I was able to do some exercises, without even holding onto anything. My left leg is weaker than my right. I had more fractures on that side of my pelvis. I start aquatic therapy on Friday… really excited to splash around in the pool!! I will never be the same since my accident, I have learned so much, and I know I’m forever changed. Living your life in a wheelchair, is difficult, but not impossible. I have a greater appreciation for people who live with a similar challenge. I understand why people dislike hearing, “disabled.” Even though I couldn’t walk, I was perfectly ABLE to do anything. I was instructed not to drive, but as long as someone was willing to take me… the sky was the limit. I went to the movies, shopping, church, restaurants, the beach. My friends went above and beyond the call of duty to include me in outings, coming over to the house to visit, bring me lunch, take me for ice cream… anything and everything! Looking back on this journey, I am not sad, upset, or frustrated. I have no regrets, guilt, or anger. None of the above. You see, everything happens for a reason. I was spared in that car accident on a foggy February night. 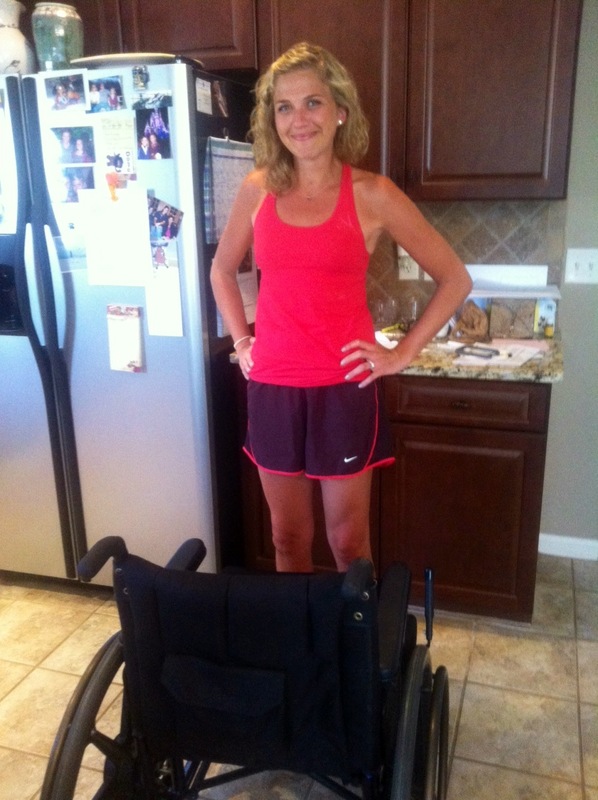 I spent three months in a wheelchair, but I’m alive for a reason. While I may not know exactly why now… I am excited to see what God has in store! In work related news… I will not be back on-air this weekend. I really wanted to be, but my legs just aren’t strong enough. It is a marathon, not a sprint. I’m aiming for my on-air debut to be Saturday, May 12th. Next Post Who said this would be easy? Thats a great day to be getting back on air! 😉 I'll be thinking of you as I am getting ready for my wedding!! 🙂 Miss you. WAHOOO!!!!! look at you all gorgeous and standing =) you are an inspiration mama. Love ya!!! You are right about wheelchairs. My Grandson was paralyzed from the waist down in an accident two years ago but it is almost unbelievable how he gets around. He has my admiration for the way he has handled his accident. I know I could never have been as strong as he has been. He has just finished his Sophomore year at the Univeristy of Georgia. (Boo!). I hope everyone keeps him in their prayers. Glad to see you on your feet.